Adams Family Haunted Woods is a Haunted Attraction located in Marysville, OH. The moon soaked trees cast eerie shadows through the haze on a family homestead in Union County, Ohio. As the chilly autumn wind carried the familiar scents of fall, it also brought with it the screams and nightmarish howls of the monsters that lurked within the Adams Family Haunted Woods. It was difficult to determine if it was the woods or the wind that was sending chills down our spine. Adams Family Haunted Woods is located in Marysville, Ohio and is a home haunt/haunted trail with a lot of character. You won’t find a stockpile of expensive props here, but what you will find is a lot of great people with a real passion for haunting and the Halloween spirit. 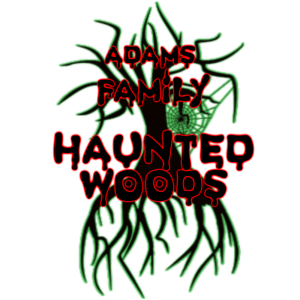 Being a family affair, Adams Family Haunted Woods is staffed by friends and family that want to have fun and provide you with a great experience while you are there. Even the little ones help out, by donning makeup or masks to take on roles as innocent victims or harbingers of foreboding doom. Outdoor trails are always a bit hard to staff, especially when the weather is less than admirable, but Adams Family had a decent level of coverage throughout the trail. They could have used some more, but there were actually more actors out there than we were expecting. There was also a nice assortment of baddies to choose from, including Jason Voorhees and Freddy Krueger. The dialogue and verbal interactivity could use a little help, however, given the young age of some of the actors, that will come in time and with a little training. We have high hopes for this group in the future. Costuming was on par with most family events. It wasn’t bad and left room for improvement. One thing for all haunts to remember is that if you are going to use iconic characters, they need to maintain the appearance and persona of the original characters. You want to maintain the look of movie characters or it takes away from their effectiveness. For haunts on a budget, creating your own costumes is a great route to go and can be pieced together from Goodwill finds or clearance sales at fabric stores. Adams Family Haunted Woods’ Facebook page does not have their address listed and the website does not seem to exist. We were able to find their address in a post and GPS took us right to the front door. There were a few signs directing us there from the main road but, we very nearly missed it and had to back up a little bit to get into the driveway. It is lined with glowing pumpkins and a dummy dangles from the trees to let you know you’re in the right place. A ghostly white rabbit greeted us in the driveway that we first thought was a prop, but hopped off into the trees when we rolled down the window to check. The folks out here are incredibly friendly and the trail, despite raining all day, was very well maintained and not a muddy mess. There is always something “special” about walking through the dark and spooky woods on a chilly autumn night. With the fun, decorated driveway and the ambient noise as you wait, there is no mistaking that you are at a haunted house and the level in the queue area matches what you find along the trail. You are at a haunted trail and there is no mistaking that fact. We were actually impressed with the amount of sound and lighting effects that they had along the trail. Getting power through the woods is never an easy feat and we typically don’t see much beyond glowsticks and battery powered lighting. Adams Family Haunted Woods actually managed to provide soundtracks in several of their scenes, which we weren’t expecting. Their sets aren’t highly detailed, nor do they have that “thrown together” feel to them. They fell nicely in the middle and provided enough detail to let you know what type of area you were in without having to try and figure it out on your own. This attraction doesn’t follow a single theme. Adams Family Haunted Woods isn’t a terrifying attraction and is definitely a place that you could take the whole family or just hit it up for a fun date night. They do get some good scares and don’t just focus their attention on the obvious targets but, trails are notoriously difficult to disguise scares on…so, for people like us that have been haunting for a long time, it is fairly predictable where the scares will come from. For your average haunt goer though, they will be a little more surprising. Admission into the Adams Family Haunted Woods is only $8.00 and it took us about 20 minutes to make it all the way through. When calculated out, that means that they provide 2.5 minutes of entertainment for every dollar that you spend, which is incredible. While this may not be a big-budget haunt, it is loaded down with a ton of animatronics and fancy scenery and the experience that you have there is certainly worth the $8.00 ticket price.